Reflected in the glow of the emerging planetary culture comes a new kind of syncretism through which we can chart countless cultures coallescing to yeild novel derivations of familiar forms. Trails are being blazed as millenia of artistic evolution comes crashing together to inform a future dappled in the beyond. In the long and celebrated podular tradition of creative innovation comes a design vignette illuminating the weave of ancient and modern. Join this two year visual journey exploring the inner artistic life of pod avatar Phong. Designing for the Galactik Trading Card Oracle Complex, Phong has developed the Vine World Suite as a vehicle for transporting sacred art into a global context. Our story begins in the Spring of 2009. 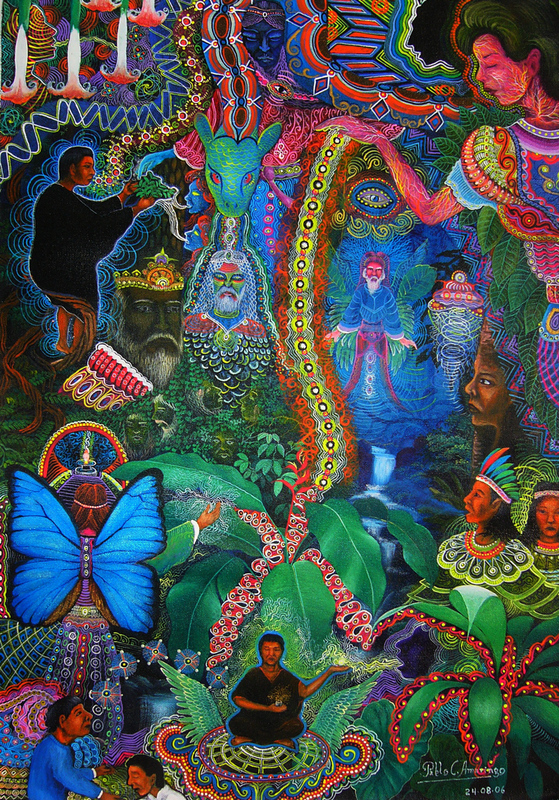 This was to be the card back fora peace of art from Peruvian Painter Moises Llerena. Inspired by the magical patternings found in the shamanic art of the Shipibo this first maquette was roughly rendered. Watch his process as the work takes shape. This is the final version that went to press. Copies remain for sale at Elfinhome. 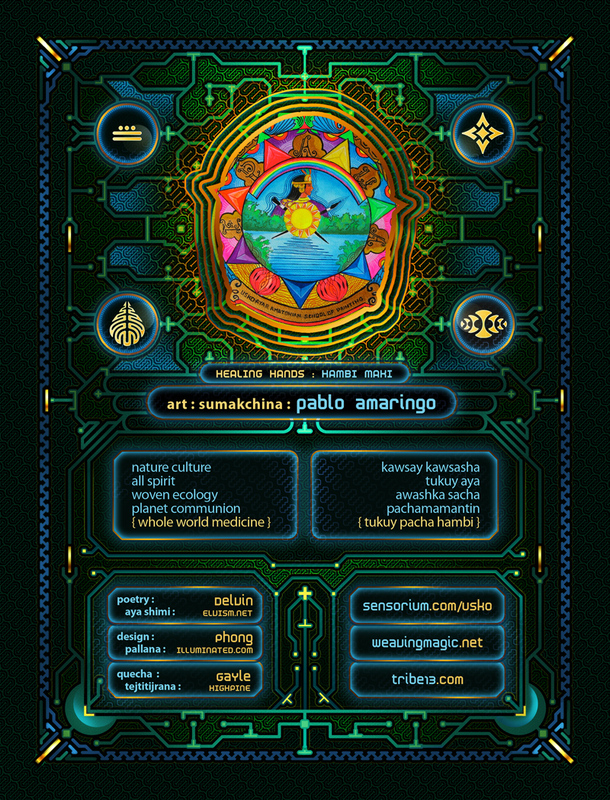 In the winter of 2010 this design envelop was pushed once again to pair with a three image hologram featuring art from Shaman-Painter Pablo Amaringo. But the story does not end here. Spring 2010 has brought new life to this design history. Coupled with an incredible art work from Martina Hoffmann, this back reflects another level of exploration. Unreal! Phong's work method is insane. This last one is so deep. The compounded detail is so lush. Holly Mozes! The level of detail!!! Mighty post this one. When does Phong's University of Vector Wizardry open? I would like to attend. Nice work. I love the Shipibo patterns and the different patches of light that permeate them. Looks hauntingly familiar. "This card feels like sacred tender for all flows internal and external." 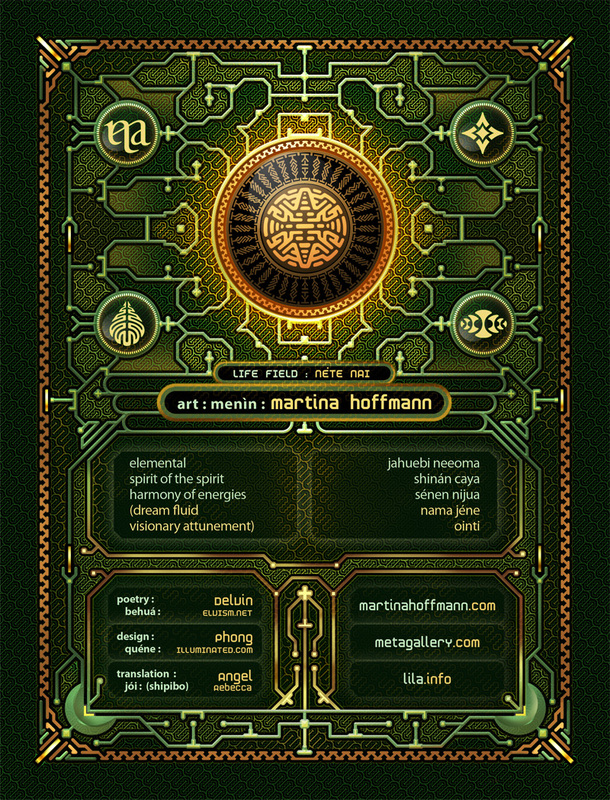 This gem drops just as I'm deepening into the flow of using art gaming cards as a tool to guide the evolution of consciousness around money, currencies, motivation, gifts and reciprocity. Delvin, I would be grateful to connect with you about what's involved in facilitating a card complex such as this, and learn from what you've already gathered. I agree his work method is great! Here's the next level Pablo Amaringo remix for the back of his piece Healing Hands. Low bows to Pablo for inspiring the pure magic, and to Delvin for faciliting the glow!